We're very excited for tomatoes this year for the CSA. We're bringing back a few that we liked from last year and adding some new ones that look delicious! This year we'll be growing tomatoes outside in the field and also inside our new greenhouse. This year we will have 11 different varieties of tomatoes this year, we're hoping to have more variety less bulk quantity. We'll have extra available for those of you that like to preserve tomatoes by canning, freezing, and dehydrating. If you want bulk quantities for preserving purposes, we will them available on pick up days! Black Krim- This heirloom beefsteak hails from the Black Sea area of Russia. Heat tolerant Black Krim has a violet-brown and purple-red, they will turn almost black with enough sunlight and heat. A big favorite at taste tests with a flavor described as tangy, rich, and sweet. Kellogg's Breakfast- This variety ended up being our favorite last year, with the beefsteak fruit weighing in 1-2 pounds. It comes from a West Virginia heirloom obtained by a Michigan man, Darrell Kellogg, of Redford, Michigan. Delicious rich flavor with a good acid/sugar balance that is very fleshy and not overly juicy. Brandywine (Sudduth's Strain)- This variety was collected from Dorris Sudduth Hill who family grew it for over 100 years. Large pink beefsteak fruits up to 2 pounds with incredibly rich, delightfully intense tomato flavor. Considered to be the most delicious strain available, a must have that we're excited to have in the garden with year! Pink Beauty- A tried and true hybrid variety that produces flavorful, flattened tomatoes. Medium sized, 6-8 oz slicers that are firm and blemish free. We heard about this variety from The Chicken Thistle Farm CoopCast who said it is their favorite tomato. Amish Paste-Reputed to have originated in one of the oldest Amish communities in Medford, Wisconsin, this popular variety produces 6-12 oz fruits, from oxheart to plum shape and often coreless for easy canning! Delicious flesh is juicy and meaty, excellent for sauce or fresh eating. It is somewhat seedier and sweeter than normal paste varieties. One of Slow Food's USA's Ark of Taste varieties! Juliet-Juliet produces small meaty fruits perfect for eating raw, delicious for salads, salsa, and fresh pasta sauce. Somewhere between roma and grape tomatoes, these delectable saladette-type tomatoes won top honors from the All-American Selections in 1999 and have been a favorite ever since. Black Cherry- The only truely black cherry tomato. These vigorous tomato plants yield abundant crops in huge clusters of 1", round, deep purple, mahogany-brown cherry tomatoes. Fruits are irresistibly delicious with sweet, rich, complex, full tomato flavors that burst in your mouth, characteristic of the best flavorful black tomatoes. Riesentraube Tomato-An old German Heirloom from 1800's Pennsylvannia. The name is German for "Giant Bunch of Grapes." Carolyn Male says in her book 100 Heirloom Tomatoes for American Gardens..."Riesentraube evokes a broad spectrum of flavor components that you just don't expect in a cherry tomato. The taste is very full, like that of a beefsteak. Amazingly intense tomato taste, not sweet, just superb!" Red Velvet-We still have some seeds from last year's snacking varieties, so we'll be growing a few of these as well to compare the flavor with our new varieties! This heirloom comes from Elmwood, new Jersey and is known for the striking silvery gray dusty miller-type foliage of the tomato plants. As well of the excellent, sweet flavor of its cherry tomatoes. Yellow Pear-We're bringing back the Yellow Pear again with its deliciously tangy pear-shaped fruit. These produce 1 oz, 1 1/2 inch sized bright yellow, pear-shaped cherry tomatoes that will produce until frost. In between shoveling snow, getting extra straw to keep the animals warm, and chopping down some of the dead trees in our own woods to keep ourselves warm, we've also been picking out new seeds and crops for the coming CSA season! With the seeds ordered and on their way, we thought we'd brighten everyone's cold day with the hope of a fruitful season to come. For cool season crops we'll be seeing a return of carrots, beets, lettuce, spinach, arugula, cut lettuce mix, kohlrabi, kale, radishes, swiss chard and turnips. Our cold season crops didn't do that well last year because the ground they were planted in wasn't tilled enough, resulting in a hard pan that the roots had difficulty penetrating. This year we're planning on seeing much more of these crops, and those that we struggled with last year--broccoli, cabbage, leeks, onions, snap peas, and potatoes as well. New cold season crops we're adding this year are celery, cauliflower, parsnips, and shallots! We are planning a summer planting of our favorite cool season crops in the partially shady spot by a hedgerow, so that hopefully we can extend the season and have fresh salad and greens for longer into the season! Parsnips-Parsnips are a root vegetable related to the carrot, it's long tuberous root has cream-colored skin and often becomes sweeter in flavor after winter frosts. It was used as a sweetener before the arrival in Europe of cane sugar and beets. The parsnip is usually cooked but can be eaten raw, it is high in vitamins and minerals, especially potassium, and also contains antioxidants and dietary fiber. Shallots-Shallots are part of the allium family with onions, leeks, and garlic. Shallots have a brown skin covering faded purple crunchy layers inside. They taste less bitter than onions, and when cooked take on a sweet edge. They ca be used raw in salad dressings, and are delicious with asparagus, mushrooms, swiss chard and peas. Also pairs well with chicken and pork! For warm season crops we'll be seeing a return of some of our favorites, as well as some new varieties for everyone to try. We'll be seeing green beans, corn, cucumbers, eggplant, okra, peppers (bell, sweet snacking, cayenne, habanero, jalapeno, ancho, and anaheim) pumpkins, summer squash, tomatoes, and winter squash again. We'll also be growing some tomatoes, eggplant, cucumbers and peppers in the greenhouse, so we will see them even earlier in our shares this year! Ruby Queen Corn-We picked up a small packet of this in a store, purely on chance last year. Come corn-picking time, it was quickly selected as our favorite out of all the corn varieties we'd grown. Beautiful red kernels, but the flavor! Extra sweet and juicy, last year Farmer Don and Farmer Figgins consumed the entire patch, what little survived the storm that took out most of our corn, out in the fields, fresh off the stalk. But this year we're planning it to be our primary corn variety, just wait till you try it! Excelsior Cucumbers-As well as doing slicing and lemon cucumbers, we're also adding pickling cucumbers to the field and greenhouse this year! We've bought a special variety, Excelsior, that does especially well trellised in greenhouses, for early cucumbers and pickles! Purple Tomatillo-AKA husk tomato, jamberry, husk cherry, or Mexican tomato. Tomatillos are in the same family as tomatoes and peppers and cape gooseberries, they bear a tiny green or purple fruit inside a paper-like husk. The fruit has a tart flavor is often eaten boiled, fried, or steamed, and are the central ingredient in green sauces and chiles. The purple varieties, like the one we will be trying this year, often have a slight sweetness, so are somewhat more suitable for fruit-like uses like jams and preserves! Delicata Squash- A unique squash with distinctive dark green stripes on a yellow background, with orange-yellow flesh inside. Also known as peanut squash, Bohemian squash, or sweet potato squash. It belongs to the same species as summer squash but is considered a winter squash. The flesh can be baked, microwaved, sauteed or steamed, or stuffed with meat or vegetable mixtures! Costata Romanesco-A distinctive zucchini known for its gray-green color and prominent ribs and most of all its delicious nutty flavor. Costata Romanesco typically have better texture and are less seedy than other zucchini types! Perfect for small squash for sauteing and larger ones for zucchini bread. Lunchbox Peppers-Red, Yellow, and Orange, these mini sized peppers are purported to be remarkably sweet and flavorful. Best eaten sauteed, as an addition to salads, or as a healthy raw snack. Can't wait to try them! We'll dedicate a whole other post for tomato varieties, but sneak-peak, we'll be seeing the return of some of last years varieties as well as quite a few new varieties to try! 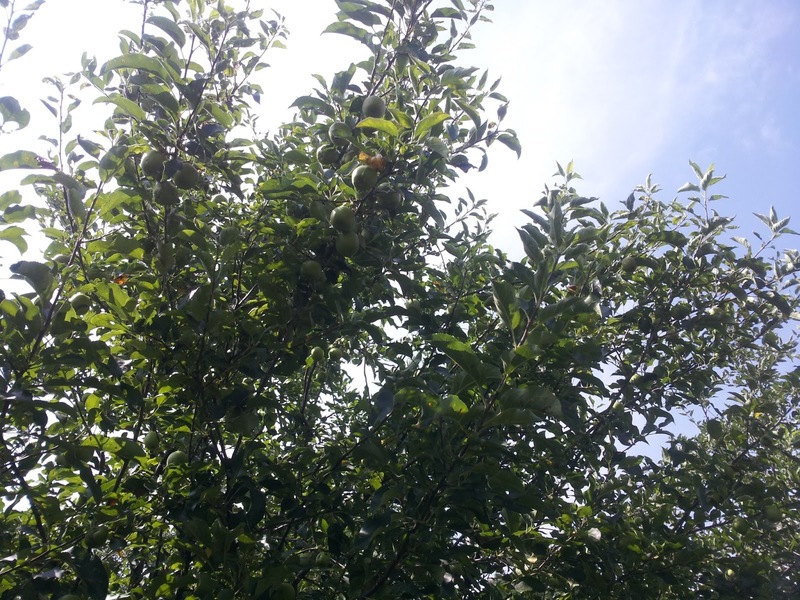 Last year we offered apples, watermelon and melons for fruit in our shares. This year we'll be bringing back our favorite varieties, like Moon and Stars Watermelon and Charentais melons as well as trying some new watermelon and cantaloupe varieties this year. Farmer Figgins has been doing some prunning of the orchard trees--which look like they haven't seen a barber in years. So hopefully we'll get apples and pears out of the orchard this year! We're very excited to be trying out some new annual fruits this year! Annual fruits? you say. Meet the ground cherry and garden huckleberry! Ground Cherry-Ground Cherries are in the same family as tomatoes, peppers, eggplant and tomatillos. Like tomatillos, ground cherries bear their fruit in papery lantern-like husks that turn brown when the fruits ripen. These plants are native to eastern and central North America and the fruit can be used for preserves, pie, raw over ice cream or in fresh fruit salads. They are stored best inside their husks for up to 3-4 weeks. The fruit is similar to a a firm tomato in texture, and like strawberries or pineapple in flavor with a mild acidity. Garden Huckleberry-AKA Wonderberry, Sunberry. Not a true huckleberry, this annual shrub is also in the Solanaceae family along with the ground cherry and tomato. It produces small metallic purple-black fruit in clusters. Tasteless when raw and unsweetened, but it can be made into a delicious mock blueberry pies and preserves! Great for freezing and canning. Last year we saw a lot of basil, lemon basil, onion chives, cilantro, parsley and sage in our shares. We'll be growing these herbs again this year and adding quite a few new ones! We're adding more perennial herbs this year, including lavender, oregano, garlic chives, rosemary, thyme and two fun ones: Stevia and Catnip! Stevia-AKA sweetleaf and sugarleaf. This herb is widely grown for its sweet leaves. We bought a few plants from a fellow farmer at the Ada Farmer's Market last year, but the dog and cat kept eating it's sweet leaves! As a sweetener and sugar substitute, stevia's taste has a slower onset and longer duration than that of sugar. It's being used by low-carb, low-sugar sweeteners commercially today in our grocery stores. It originated in the Americas, the leaves of the stevia plant have 30-45 times the sweetness of ordinary table sugar. The leaves can be eaten fresh, or put in teas and foods. Medicinally it has traditionally been used as a cardiac stimulant and as a treatment for obesity, diabetes, hypertension and heartburn. Catnip- AKA catswort or catmint. Catnip looks much like regular mint plants, but with brown-green foliage. In humans, the herb is commonly used in herbal tea blends for sleep, stress reduction and relaxation. It is also used as a culinary herb in many dishes. Catnip is best known for its behavioral effects on the cat family--not only on domestic cats but also other species of cats, like tigers, leopards, and lynxes! Catnip contains a feline attractant nepetalactone--when its leaves or stems are bruised cats smell this compound and start rubbing on the plant, rolling on the ground, pawing at it, licking it, chewing it. If they consume the plant their behavior turns to drooling, sleeping, anxiety, purring and leaping about, the response usually lasts for 5-15 minutes. Not all cats are affected by catnip, roughly 1/2-2/3 are affected by the plant, it seems to be a hereditary trait. So even if your cat is not affected by the plant, at least its human masters can use it as a culinary herb or for tea! So we hope you enjoyed your sneak peak for the 2014 CSA Season! We still have shares available, check out Our CSA page to learn more and sign up! We've been having a hard, cold and snowy winter here in Michigan, with freezing rain, heavy snows, and the bitter cold of the Polar Vortex. We've been staying warm with our new wood stove and enjoying frozen vegetables from the farm, canned applesauce and salsa and the best pork we've ever had. This recipe has been one of our favorites this winter and become our favorite way to use the bulk seasoned sausage from our hogs. 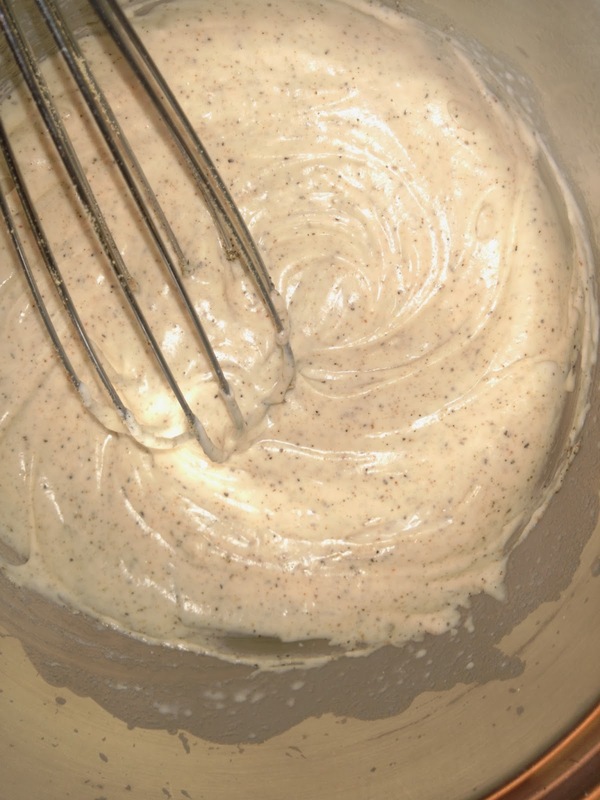 The gravy has a bit of a kick, so you prefer it a little mellower, reduce the cayenne pepper and black pepper. Thin it to your desired consistency with coffee or warm milk. 2. Mix together ingredients in a medium sized bowl. 2. 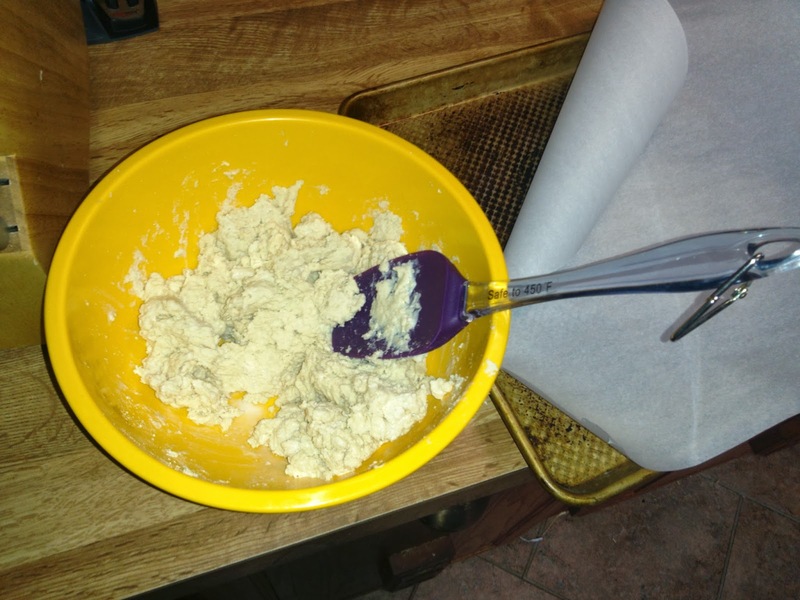 Drop by spoonfuls onto parchment paper on a cookie sheet. Flatten the top slightly with fingers greased with olive oil. 4. Bake at 450'F for 8-10 minutes. -1/2-1 cup warmed milk to thin out gravy or black coffee for "red eye gravy"
1. Fry up 1lb bulk sausage of your choice. Cook in cast iron pan with 1 tablespoon of water in the pan to help disburse the fat and cook more evenly. 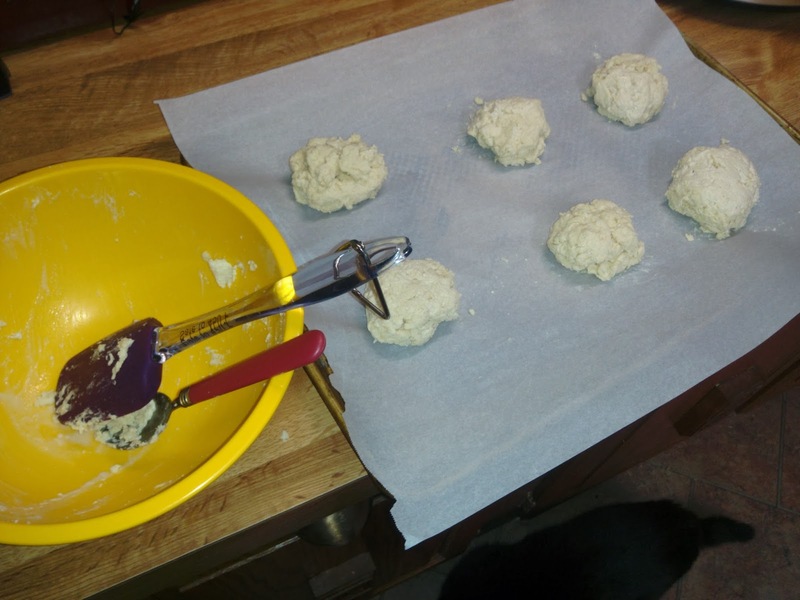 Break into crumble size pieces as cooking, drain. 2. Reserve 2 Tablespoons of water/grease liquid for the gravy. 3. 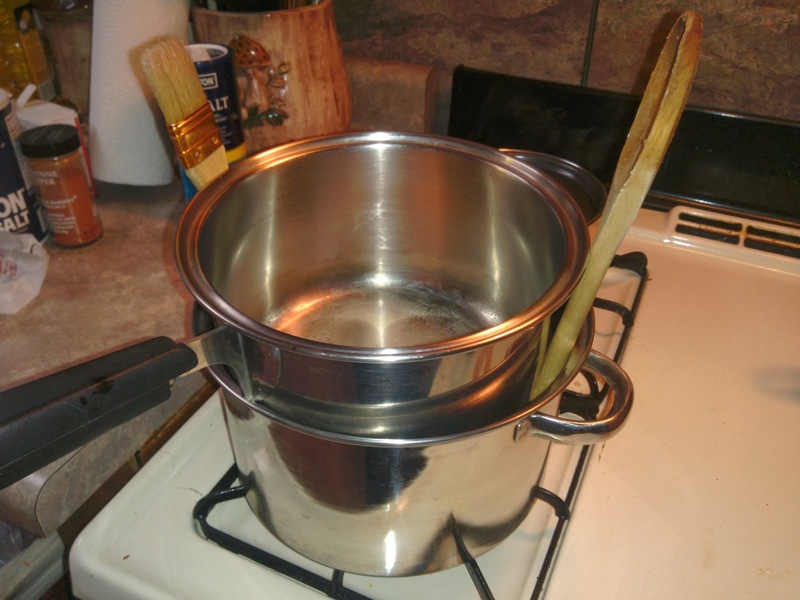 Using a small or medium sized double boiler, bring the water in the bottom to boil. If you don't have the right size, you can always improvise! 4. In a small saucepan, heat up 1 cup half and half, scalding it. 5. Melt 3 tablespoons of butter in the double boiler. 6. Whisk 3 tablespoons of flour into melted butter. 7. Add in scalded half and half, slowly adding while whisking constantly. Cook over simmering hot water, whisking constantly, until thick and smooth. 8. Add the spices and combine. 9. 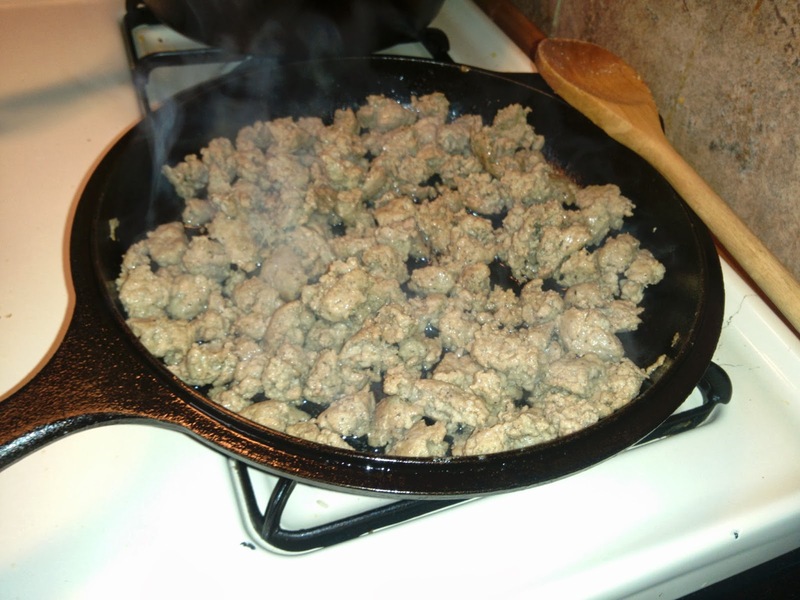 Add the 1 lb cooked sausage and 2 tablespoons cooking liquid and combine. 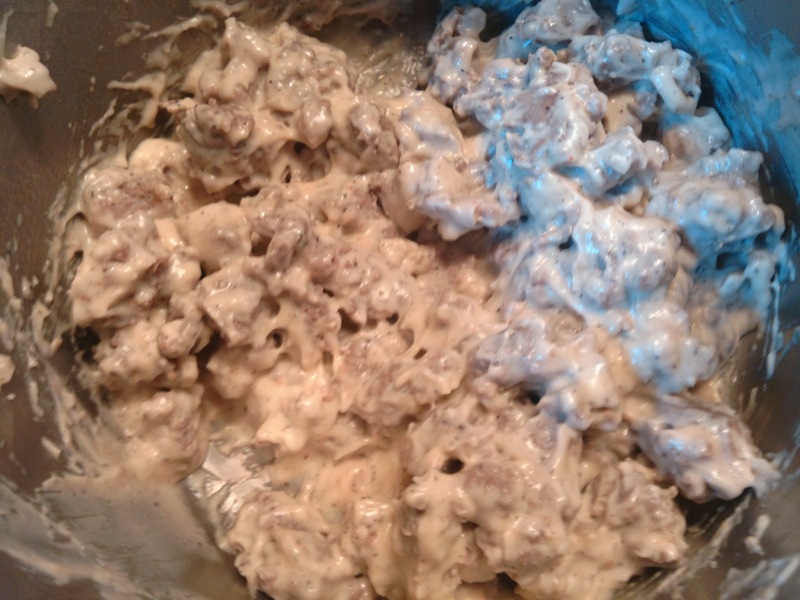 Sausage gravy will be quite thick by now. 10. 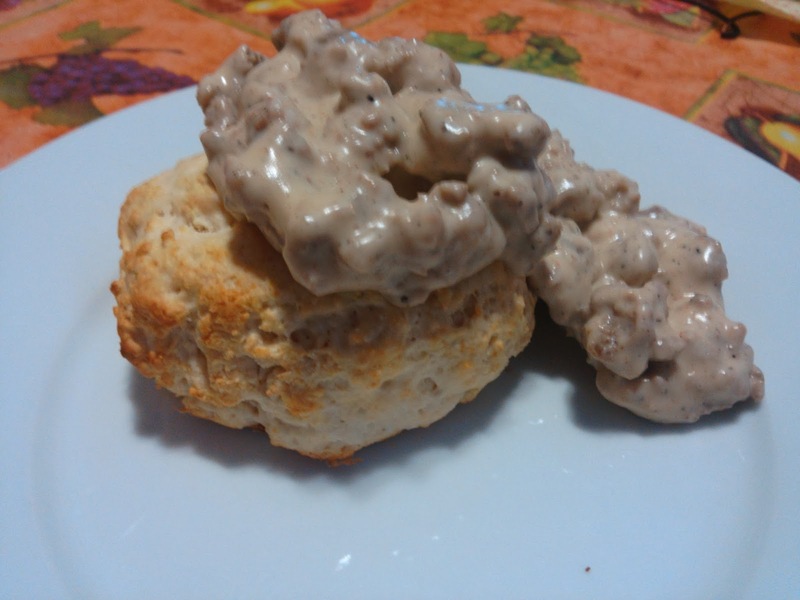 Add 1/2 cup to 1 cup warm milk to the sausage gravy, or black coffee for "red eye gravy" to thin the sauce to desired consistency. 11. 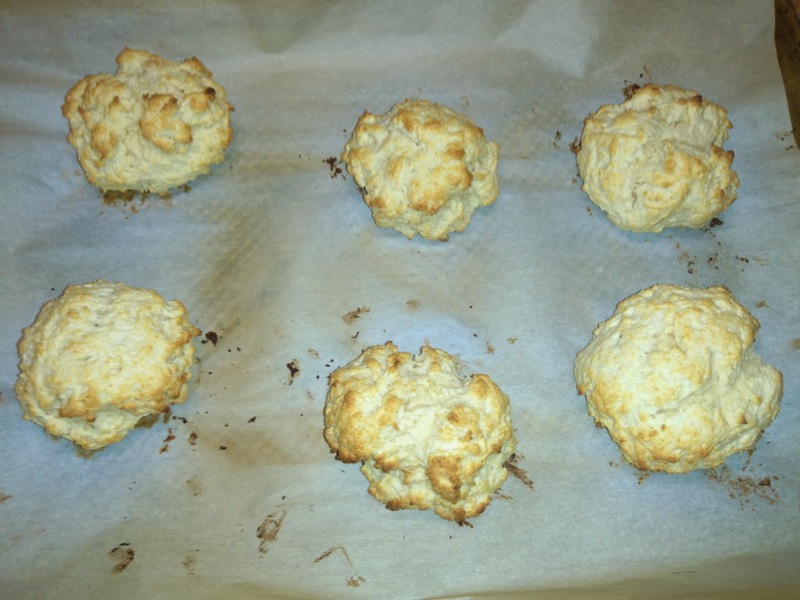 Top on biscuits and enjoy!